I did it! Three Thanksgivings in a row and I haven’t fallen into a food coma. This might have happened if I ate turkey everyday, but thankfully I didn’t. My husband, my soon-to-be-married sister Sarah, Sarah’s fiancée Travis and I celebrated Thanksgiving with my father yesterday afternoon. I was most thankful to Sarah for preparing the meal. I brought the same delicious Pumpkin Pie for dessert, but Sarah cooked everything else. Sarah was very nice to cook all the food with olive oil or the vegan Smart Balance butter. I love my sister so much, she basically raised me and cooking was always a big part of her life. She is pursing her passion for cooking and is so close to getting her degree. I couldn’t be more proud of her, and what a delicious profession she has chosen! 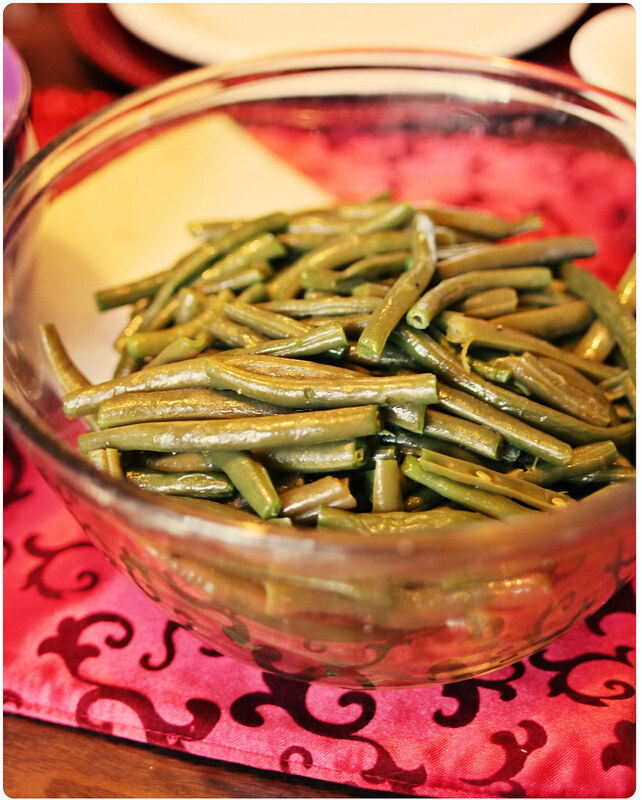 Canned green beans have nothing on fresh green beans. I’ll never touch canned vegetables again! Although these potatoes look similar to the ones I cooked for Mark’s family’s Thanksgiving, they were totally different. 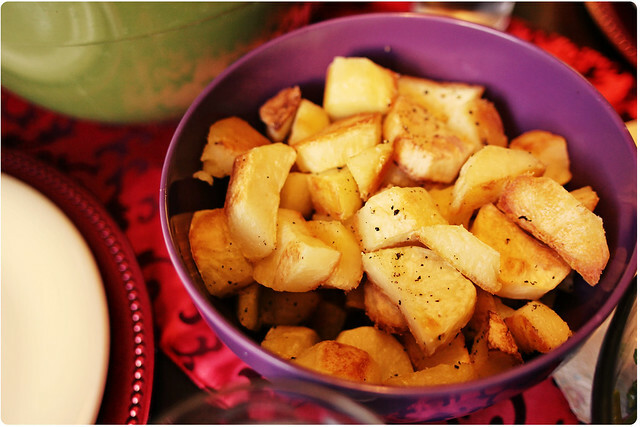 Sarah’s potatoes were crispy and added the perfect texture to the meal. 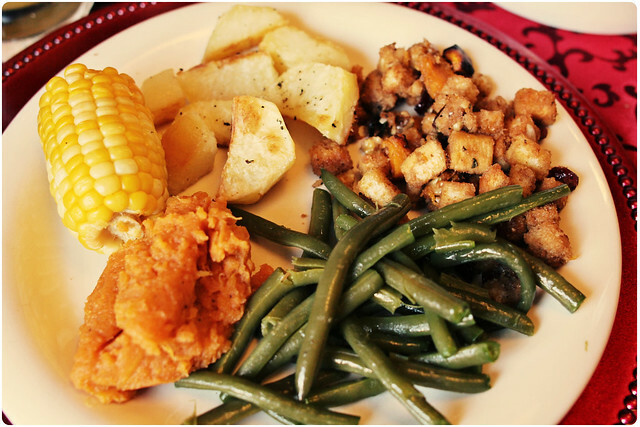 The corn and green beans where just boiled and seasoned, but the sweet potatoes were completely transformed. I really like sweet potatoes, but I don’t love them so it means a lot when I say I really loved this sweet potato mash. Granted there was a tremendous amount of sugar, there was also nutmeg, cinnamon and vegan butter. Yum. My very favorite dish was her stuffing (or dressing). It was made from fresh french bread croutons, Newman’s Own Balsamic Vinaigrette Dressing, Salt, cranberries, pecans and love. I have some in my fridge and although you might think I’m over Thanksgiving food, I feel like some leftovers! I know I said I didn’t fall into a food coma after my meals, but I did sleep like 12 hours last night and I haven’t had breakfast yet! Now Thanksgiving is almost officially over (after lunch it will be official). We’re heading over to a friend’s birthday party so I might want to whip up some cookies for him. Thanks for following my triple-Thanksgiving madness, come back soon for more awesome vegan food! 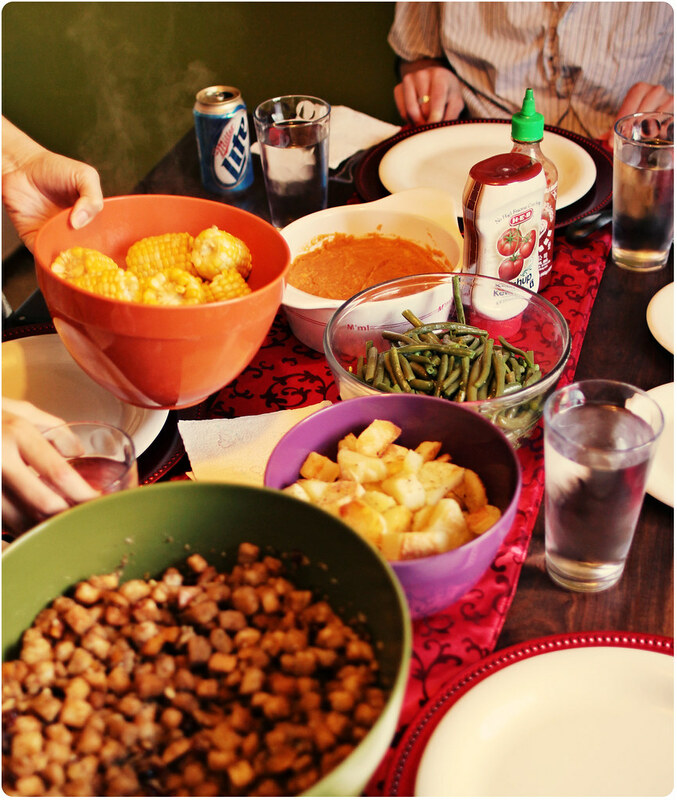 This entry was posted in Celebrations + Holidays, Chef Sarah Lee, Family + Friends. Bookmark the permalink. Loved having you both over and I’m glad you liked everything! Thank you for visiting Veggie Angie! I'm Angela Walley, a filmmaker and vegan based in San Antonio, Texas. I created this blog in 2010 to share my love for family, friends, and delicious vegan food. Read more. I'm currently on hiatus. Subscribe below to get my first post back directly to your inbox!